Using KarmaCRM, a new and robust database system, users will immediately see what is so special about it – and, it’s not an intimidating number of overly complex features, it’s the fact that it’s simple on the outside, yet agile on the inside. I have to commend the Karma team for their openness and incredible response to our needs and suggestions. This is a great product backed by an outstanding team; it should definitely be on your short list when choosing a CRM system. 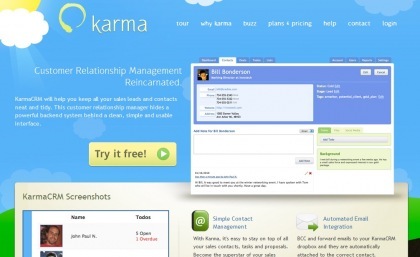 About KarmaCRM: KarmaCRM will help you keep all your sales leads and contacts neat and tidy. This customer relationship manager hides a powerful backend system behind a clean, simple and usable interface. KarmaCRM helps you elevate the performance of your sales team by consolidating and sharing all of your correspondence online. No more searching for sticky notes, napkins or receipts with phone numbers scribbled on the back. Use Karma to track all of your tasks and link them to contacts, deals and companies. Karma also helps team managers monitor the progress of their sales team and their leads. Use Karma's reporting to easily check who is completing their tasks and who has too many overdue deals. Now, you and your sales team will know exactly where everyone stands. About John Paul Narowski: John Paul Narowski, expert in internet marketing, is founder of web-based customer relationship management software, KarmaCRM. As a specialist in website and software development and design, John Paul helped found MetaSpring LLC and was lead developer for Ave Maria Foundation. John Paul can be contacted at: jp(at)karmacrm(dot)com. http://www.karmacrm.com/mediakit.zip (This includes screenshots and a media kit PDF).